Learn the steps to replacing a simple plastic pull chain light fixture or lamp holder. In this informative video, the Internet Electrician demonstrates the removal of a faulty pull chain lamp holder, and replaces it with a new light fixture. 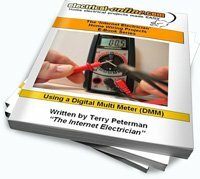 This is a simple DIY home wiring project, but does require attention to all safety guidelines and procedures. This entry was posted in How-To-Videos and tagged light switch, plastic chandelier, plastic lamp holder, pull chain, pull chain light fixture. Bookmark the permalink.